In a recent letter to the editor in the Journal Star newspaper of Peoria, Illinois (home of heavy machinery giant Caterpillar Corporation's headquarters), Mike Coogan of the US Campaign argues that "Caterpillar's inability to live up to its own social responsibility code is starting to pose serious problems for the company's bottom line." 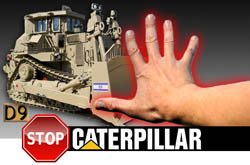 Citing the recent removal of Caterpillar from the World Socially Responsible Index by MSCI Inc., a leading investment decision support provider, and subsequent divestment by TIAA-CREFF, he suggests that Caterpillar's business can only be harmed by the corporations continued complicity in Israeli human rights abuses. Currently, D9 bulldozers manufactured by Caterpillar are used by Israel to demolish Palestinian homes and civilian infrastructure. As a result, according to Coogan, Caterpillar is "in the business of civilian displacement and flagrant human rights abuses," and their shares will continue to lose value due to the divestment of socially conscious investors. Want to help stop Caterpillar's support of Israel's demolition of Palestinian homes? Join our campaign and TAKE ACTION to let Caterpillar know that their complicity in Israeli human rights abuses is unacceptable!